What is Underoath currently up to, being that you have upcoming tours in Canada, Australia, Japan, and Europe kicking off soon? CHRIS: Pretty much we’re just going to be on the road forever. That’s the plan. We’re flying out on Wednesday to start our headlining tour in Canada. Silverstein, Moneen, and He Is Legend will be on that. It’s going to be freakin’ cool. We are going to be playing some places that we haven’t played in a while and weren’t able to play on Warped Tour. It’s going to be rad. We do Taste Of Chaos International with Taking Back Sunday, Anti-Flag, and Thursday. That goes all over, like Japan and Australia. We’re taking the holidays off, and then doing a headlining US tour in February. Underoath dropped from Warped Tour early this year. To this day, you have almost 7000 replies on the website about that tour drop-off. How are things working among the band members now? CHRIS: We took that time off because there was a lot of stuff going on between all of us. It was a thing where we’ve always been the band that puts our friendship and everything between us in front of anything else. We knew that playing the last two weeks of Warped Tour wasn’t as important as working on our friendships and the problems we were having. We took the time off—we’ve been home for about a month and a half now—and done a lot of playing and talking. It’s worked so much for all of us. There’s been talks that has been needed to happen for years that are finally happen. God has done so much for us over the past month. It’s like we’re starting all over again. I’m excited to get back on the road because it’s like a whole new beginning for us. What caused the heavier sound on Define The Great Line compared to They’re Only Chasing Safety? CHRIS: It wasn’t really a conscious effort as far as how heavy the record was. We started writing this record about a week-and-a-half after we were done recording They’re Only Chasing Safety so it’s been years in the making. That’s just how it came out. We aren’t a band that sits down and says, “We should have this record or this song to sound like this.” We are more of, “What do you think about using this riff?” We’ll jam it out and see how it goes. That’s honestly how it came out. The only conscious thing with the record is that we wanted to have it be more cohesive and flowing, as well as doing stuff we had never done before. Those were the only conscious efforts. The whole feel and heaviness just worked out that way, and we are really proud of it. Do you have any b-sides you play on releasing out on compilations or an EP? CHRIS: We are the type of a band that writes ten songs or so, and those are the songs on the record. We write really slow, not like the bands who record like eighteen songs and pick the best eleven or twelve for the record. What we have is what we record. There’s been small talks over the past couple of days between me and Tim about maybe doing some sort of experimental EP doing stuff we haven’t done. That’s very unofficial, and we don’t have any plans right now of doing that. Our focus is being on tour and promoting this record. Do you have any more music videos coming, or have we seen all the videos from the new album? CHRIS: The video we have out now was actually part of two videos we shot on the same shoot. I think the other video should be coming out later this month. We shot them both at the same time so when the second single comes out, we don’t have to take time off of the tour to record the video. We will probably take time off and record another video, but we haven’t figured out what song yet. We plan to have at least three videos on this record. What particularly brought you as an individual into music and Underoath? CHRIS: Personally, what brought me into music was stuff like Credence Clearwater and Guns N’ Roses and all those bands. As far as heavier stuff, when I was a teenager I was into Cannibal Corpse, and then got into Living Sacrifice and Zao later on. 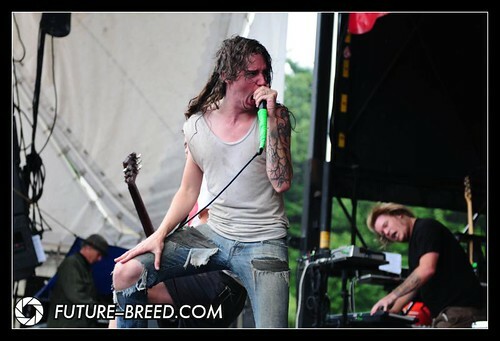 I fell into being in Underoath. Before I was in the band, I was friends with all the guys and hung out with him all the time. Our old singer was originally playing keyboard. One day he said that we were going to get a keyboard player or get rid of the keyboard, so he asked me if I wanted to try out. I tried out and ended up working out…. I was about sixteen or seventeen so that was quite a while ago. Do you have any final words to the fans who have come out and stuck by Underoath through the tough times here? CHRIS: I know bands say this all the time, but there’s no possible way that we can do what we do without those people who go and buy the records and go to shows. I don’t know if people sit down and think about the fact that them going to a show and buying a ticket and t-shirt is what makes it possible for bands to stay on tour. The people who support us specifically are awesome, especially with all the stuff with us dropping off Warped Tour. We had a lot of people praying for us and wishing for the best for us. I thought that was amazing. I’d like to thank all those people. The prayers and thoughts honestly help a lot. We knew that people were praying through us a lot, and it really pulled us through the whole ordeal. We’re just really excited to get back on tour and see all those people again and play shows.